Hey there, my dear readers. I know I've been a little absent on my blog lately. I have been trying to decide in what direction I want to take my blog and how I can make it more interesting. But I don't want to talk about that now, today I want to tell you and hopefully help you to become a clever shopper. Before we start I really want to show you my beautiful new purchase. I really wanted a classic, black pair of designer heels for a while now and decided to try a few department stores. Just to let you know those tend to do bigger discounts on designer items than the designer boutiques themselves. 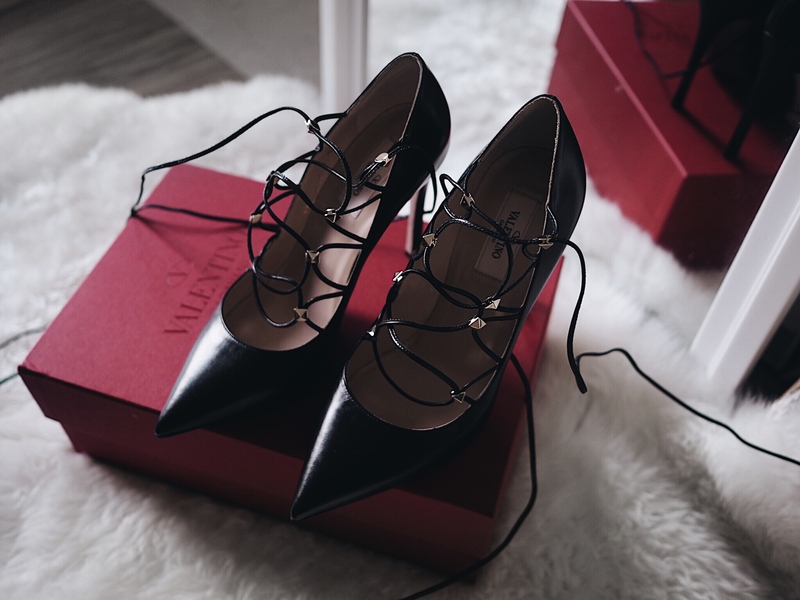 I managed to score these Valentino beauties for about 60% off. They only had one pair, in my size, undamaged. I obviously had to go for it, there was no 'maybes'. They look even more amazing on my feet and I cannot wait to show you. But for now, let's find out how to become a smart shopper. How many times have you bought something when it's on sale only to realise in 6 months that you have never worn that item? This used to happen to me way too often, because sale periods in London can drive you crazy when items are up to 70% off. I must say Zara is one of the most dangerous places. Even if you leave with a few items costing £9.99 or £19.99, it adds up to a big sum, and you get home to find that you didn't really need 2 of the 7 items you got. You kind of regret it deep down, but you don't want to admit it to yourself so you stack it away with the hopes of wearing it one day and you never do. So, after so many years of shopping and doing big mistakes here are my top tips on how to be clever when shopping. When you find an item, if your first thought is not I WANT THIS RIGHT NOW, THIS IS PERFECT FOR ME then don't buy it. If you are thinking 'Yeah, it's not bad, maybe I would wear it in the summer' then you need to put that item back and walk away. The first thought is everything. Even now I have days when I say to myself, I know I trust myself but I really like it, maybe I will wear it. And I always disappoint myself. Even one little maybe is a big NO. If you are really not sure about the item and the 'thinking' rule didn't help, you still can't really walk away but you're not a 100% sure then the 24 hour rule is for you. Once you thought that you're not sure, the best thing to do is to leave it and leave the store. If you get home and can't stop thinking about that item, go and buy it the next day. It's a bit more safe if the item is not on sale. But trust me, this has been tested and it works really well. 9 times out of 10 I will leave the store and never think about the item again. If the item is on sale however, I tell myself this : if I really wanted it, I would buy it right now, if I want it tomorrow I will come back, if it's gone I won't be sad, that means it wasn't meant to be and I won't be sad. Sometimes I will find an item that doesn't match my style at all. But I will think to myself OMG THIS PINK SHINY PAIR OF SHOES IS SO COOL. I know it's not my style, I know I will only wear it once or never but I buy it anyway because it's so damn cool and different. But guess what, different is not always a good idea. Just because you bought something different or unique doesn't mean you will actually wear it. Wait till the time comes when you put the pink pair of shoes on but change into your favourite black pair right before leaving the house. Then, you will try to sell that item somewhere online a year later, but guess what? It's not on trend anymore and you will lose money. Unless you really know yourself and know you will wear the item or have a special occasion, my recommendation would be to stop yourself. Sales are the biggest ways to make you spend your money. I'm not gonna say they're not great. I got so many amazing items on sale that I wear all the time. But too many times we get attracted to something just because it's on sale. How many times have you checked the price of something quite cute and thought 'Oh, that's a good price, hmmm'. That's when you need to remember the 24 hour rule and to think before you buy. I must say, I do still get home sometimes to find that I didn't really need that grey blouse which I will probably never wear, but to be honest I have saved myself so many times with these few simple tricks. The best one is definitely to leave it, and come back the next day or whenever to get it if you really want it. I really hope I was able to help you and please please let me know if you try using these tips and they help you or don't help you at all. Maybe you have any other tips?